An Ashland woman realized a lifelong dream by spinning the wheel on the Wheel of Fortune and she came home much wealthier from the experience. 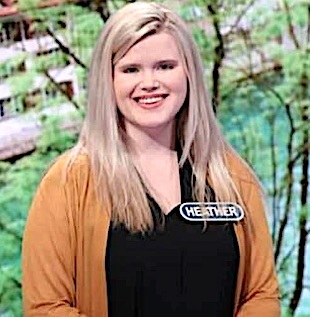 Heather Hughes, who attended a wheel-mobile raffle in Charleston, W.Va., for audition purposes, was selected for the show and took home $67,700. Her appearance aired Monday night. Hughes, her husband, mother-in-law, and mother all spent two days in California filming the show. She said her family was supportive. Hughes, an aspiring actress who works in a shoe store in Ashland, and her parents spent time when she was a child watching the show together, she said. Wheel of Fortune debuted in 1975 and has been one of the most popular game shows on television with longtime hosts Pat Sajak and Vanna White. The show consists of five rounds and three toss-up rounds where contestants spin a wheel and guess a letter to solve the world puzzle. The contestant with the most money at the end of the rounds has the opportunity to enter a bonus round. Virginia "Ginny" Maynard, 88, Glenhayes, W.Va.